Mechanical Tension: done by using heavy resistance on the exercise and completing fewer reps. Muscle Damage: done by focusing on the eccentric (lowering) portion of the exercise. Metabolic Stress: done by extending the set, shortening the rest period, feeling the muscle work and getting the “burning” sensation while doing the exercise. My trainer, Corey shared that in his experience, women respond really well to exercise focused on muscle damage and metabolic stress (numbers 2 and 3 above). However, he stated that exercises which focus on mechanical tension are often overlooked by women. Incorporating mechanical tension into your routine is a great opportunity for those who want to build muscle and strength. My arm workout is a combination of 5 different exercises, all of which incorporate drop sets. The weight I’m lifting depends on the type of workout I’m doing… sometimes lower weight, higher reps and other times it is the reverse: heavy weight and lower reps. Don’t be afraid to mix it up! This exercise targets the rear deltoid and develops strength and density through the shoulder region. All you need are dumbbells and I like to rest my forehead on something (but this isn’t necessary). Bend your upper body so it is just about parallel to the floor. Keep your knees slightly bent, chest out and back flat. Let the dumbbells hang directly beneath you with your arms straight (but don’t lock your elbows), with your palms facing each other. Lift arms up and away from your body, so they are parallel to the floor and return to starting position. Repeat. Tip: Try to contract the shoulder blades together at the top of the movement and keep your upper torso stationary as you lift the weights. This exercise targets your triceps, a three-headed muscle that covers the entire rear portion of your upper arm. You’ll need a cable/pulley machine for this exercise. Using the cable-pull, stand with your feet should width apart and grip the bar with your palms facing down (overhand grip). Bring your arms close to your body and perpendicular to the floor. Keep your arms close to your sides as you push the bar down until it touches the front of your thighs and your arms are fully extended. Only your forearms move, keep the upper arms stationary. Exhale as you push down and breath in as you bring the bar back up to the starting position. This exercise targets your bicep muscles and forearms and uses a cable and pulley machine. To start, stand upright while holding a cable curl bar that is attached to a low pulley. Grab the cable bar at shoulder width with your hands facing up. Your knees should be slightly bent and arms should be close to your sides. Curl the bar up by contracting your bicep muscles. Continue the movement until the bar is at shoulder level. Slowly release and repeat. This exercise again targets your bicep and uses a seated arm-curl machine. With your upper arms positioned against the bench pad and your chest against it, hold the bars and lift. Only your forearms should move while your upper arms stay on the pad for the duration of the exercise. Lower the handles slowly to the starting position as you inhale. Stand upright while holding a cable curl bar. Keep your elbows close to your torso and grip the bar with your hands facing up. Curl the bar up until it is at shoulder level and slowly bring the bar back down to starting position. If you don’t already, try incorporating a workout focused strictly on strengthening your arms. 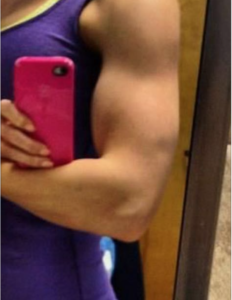 Not only will you be stronger, but you’ll have more definition in your arms!